The two wearables highlight the new features of Google's mobile OS, but only the larger model will enjoy true freedom from a phone. At long last, the first Android Wear 2.0 watches have arrived. Rumored for months and subjected to endless leaks, they are indeed a collaboration between LG and Google, but if you’re looking for a “Pixel watch” or even a “Made by Google” seal of approval, you might be disappointed. The new watches, which will be available for purchase tomorrow, are LG watches through and through. The box may say they were “designed with our friends at Google,” but you won’t find the “G” logo anywhere on it. And if you’ve been keeping up with the rumor mill, there won’t be many surprises. Watch this space: The new Android Wear watches may technically be a collaboration, but we’re still waiting for a true Made by Google or Pixel watch. These aren’t even really Nexus watches, since the OS is the same across all Android Wear devices, but they should set the tone for future Android wearables. 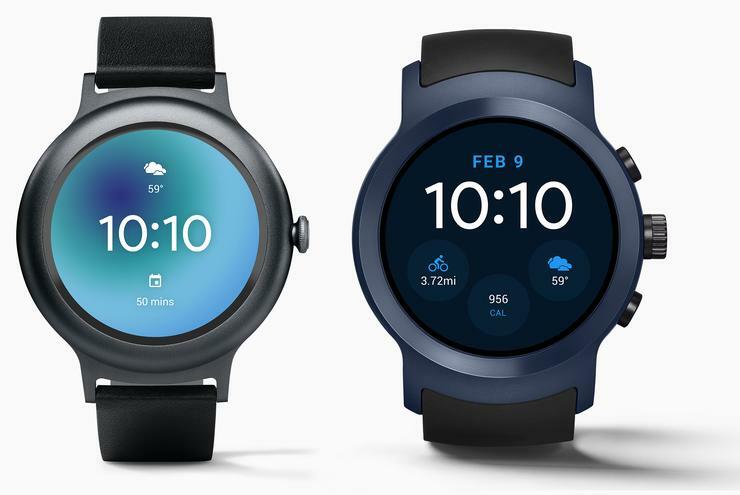 Circular faces are certainly here to stay, but it’s also likely we’ll start seeing crowns, dedicated app buttons, and NFC sensors in future watches as Google takes another big swing at bringing Android Wear mainstream. There’s a lot of ground to cover to catch up with Apple, but this launch should serve as kind of a reboot for Google’s wearable platform, injecting a bit of excitement and turning an eye toward the future. There are two sizes to choose from, Sport and Style, with the latter geared toward slighter wrists. The larger model features a 1.38-inch P-OLED screen with a 480 x 480 resolution and 348 ppi, while the smaller variant sports a 360 x 360 1.2-inch P-OLED with 299 ppi. Both watches feature a 1.1GHz Snapdragon Wear 2100 chip and 4GB of storage. The Sport model of the LG-Google watch packs a ton of sensors and chips, but it is extremely thick. 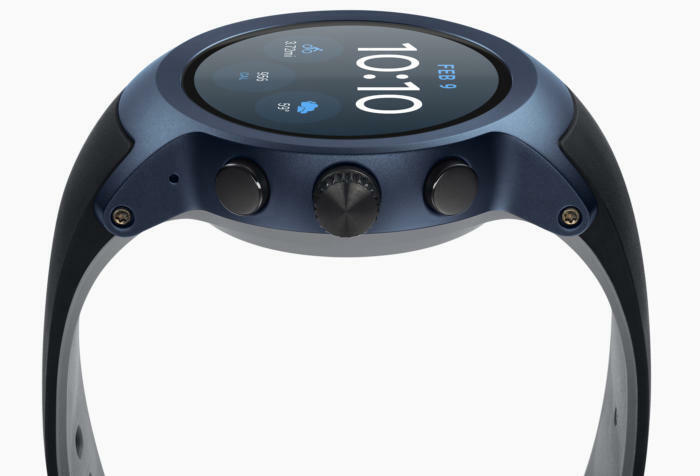 They also both include built-in Wi-Fi and Bluetooth, as well as an accelerometer and gyroscope for fitness tracking, but the Sport model packs a ton of extra functionality into its rather thick body, including GPS, LTE, NFC, and a heart rate sensor. That means the smaller Style model won’t be able to do much of anything without having a phone nearby, and even when tethered it still won’t be able to take advantage of Android Pay, one of the marquee features of Android Wear 2.0. Besides the extra sensors and chips, adding to the Sport’s 14.2mm thickness is a 430mAh battery, versus 240mAh on the Style model. The Sport also includes more RAM (768 vs. 512), and IP68 water and dust resistance, besting the Style’s IP67 rating. The two watches are available in a variety of colors, with the Sport coming in titanium and dark blue finishes, and the svelte Style dressed in softer silver, titanium, and rose gold hues. Additionally, the Sport model includes a “high performance elastomer strap,” while the fashion-geared Style is paired with “snap-and-swap 18mm leather and silicone bands so you can quickly switch bands to match your look or the occasion. The straps on the Style watch can be swapped out to change the look. Additionally, both watches will include a rotating power button, akin to Apple Watch’s Digital Crown, for scrolling, accessing apps, and summoning Google Assistant. Furthermore, the Sport watch includes two hardware buttons dedicated to launching Android Pay and Google Fit. 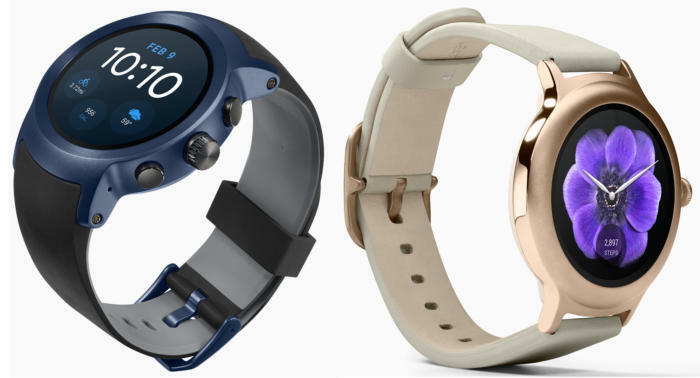 Both watches will be available in the online Google Store (the only way to purchase the dark blue Sport variant), and the $250 Style will also be sold at Best Buy. The LTE-enabled Sport model will cost $350 and be available at Verizon and AT&T stores as well, and Google says the watches will be coming to Canada, Russia, Saudi Arabia, South Africa, South Korea, Taiwan, UAE, and U.K.in the coming weeks. As previously announced, Android Wear 2.0 is a major revamp of Google’s wearables OS, with interface and navigation tweaks throughout, and a handful of new features. The two watches are the first devices to run Android Wear 2.0, but it will be coming to a slew of existing models, including the ASUS ZenWatch 2 & 3, Huawei Watch, LG Watch R and Urbane, Moto 360 2nd Gen and Sport, and many others. 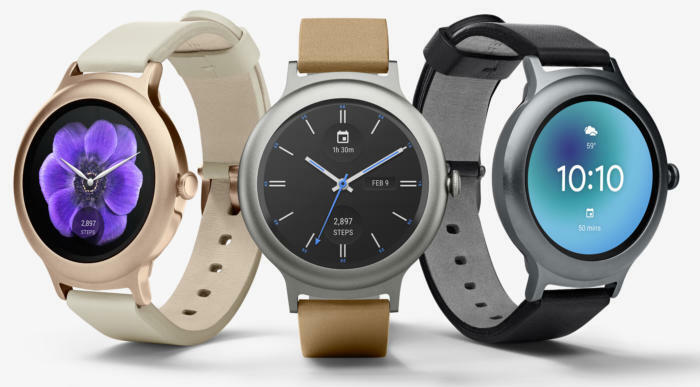 The extra buttons on the Sport watch will launch the Google Fit and Android Pay apps. The new update also brings Google Assistant to the wrist for the first time. Like the Pixel phones, it will initially only be available in English and German on Android Wear, but Google promises an expansion to other languages in the coming months. And the button functionality won’t be limited to the LG phones. As Google explains, Google Assistant can be summoned by saying “OK Google,” or by holding down the power button on your watch, so presumably it will be a requirement for watch makers. Also coming with the new update is support for Android Pay. All watches fitted with NFC chips will be able to pay at checkout counters by holding their watches next to a credit card terminal. Google has already updated its Play Store listing with the relevant info, but currently the only watch to support mobile Android Pay is the LG Sport. However, new supported watches should begin hitting shelves soon enough. The Style watch doesn’t include an NFC chip for mobile payments. Right on cue, VentureBeat has posted a photo of the upcoming ZTE Quartz, which has just received its Bluetooth certification. Based on the pictures, there’s just a single power button on the watch, so it’s unclear whether other phone makers will build dedicated buttons to access Android Pay like LG has done. But NFC and Android Pay is sure to be a standard feature of all new models being released.